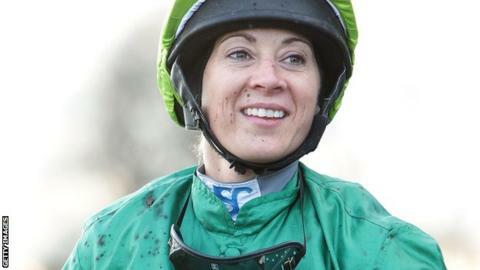 Hayley Turner, Britain's most successful female jockey, finished second in her final UK race as Litigant won the November Handicap at Doncaster. Turner, 32, retiring this year after 763 winners in a 15-year career, had five races on her final day. She was no higher than fifth in the first four but was pressing for the lead aboard 25-1 shot Buonarroti into the final furlong, on heavy ground. However, 10-1 Litigant powered through to win by four-and-a-half lengths. Turner was riding Buonarroti for trainer Declan Carroll, who gave her a first opportunity in the saddle in 2000. She has one more assignment as a jockey, travelling to South Africa next week for the Jockeys' Challenge. The Nottinghamshire rider was given a warm reception on her return to the paddock and was full of praise for both her mount and the winning rider. "I'm delighted for George, he works so hard. He's a heavy chap and he has to really put the effort in," she said. "The horse ran a blinder. Declan actually really fancied him before the race so he gave me plenty of confidence. "I did [think I might] win but when George came past me like that, I thought he would do well to hang on for second and he did and kept going. He's run a blinder. There's no tears - I feel all right about it." It was a second victory for trainer Joe Tuite with Litigant but Baker rode the horse to victory three times under trainer Seamus Durack. "I know he had top weight but he is a class horse and without doubt he is going to step up and be a Cup horse next year," the jockey enthused.